Hanukkah is a time when even the youngest like to get involved with things such as lighting the menorah. But how do we get around the dangers involved with children and fire? 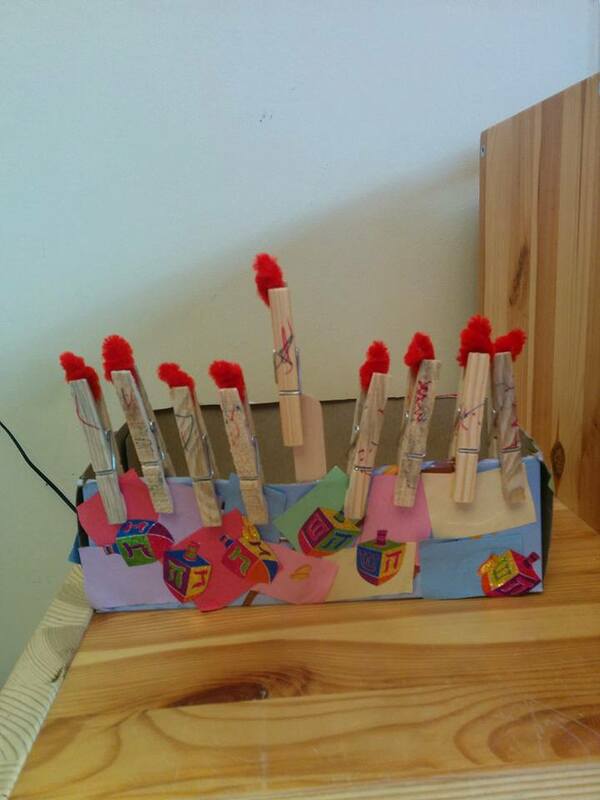 I made this adorable Hanukkah menorah craft for my toddler, so that he can “light” the menorah along with us. 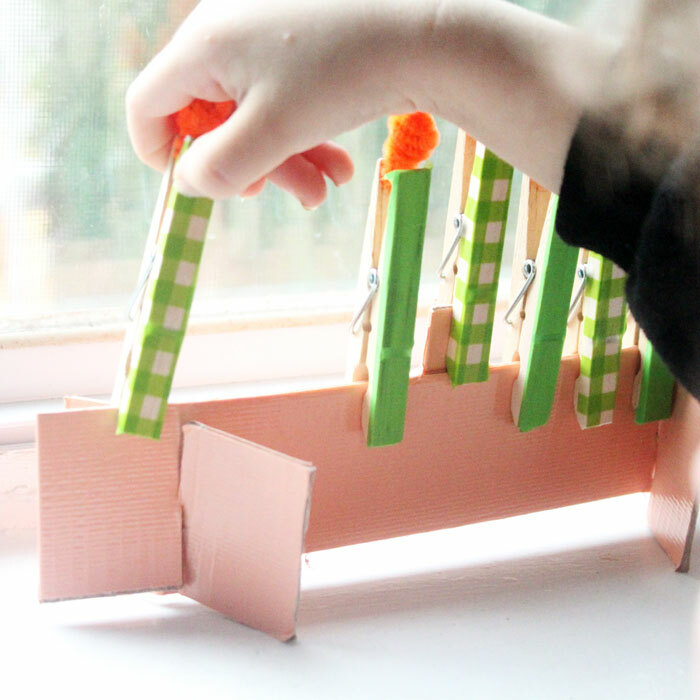 It involves many new skills too – counting, furthering his fine motor skills and grasp, and even patterns. When I was a child, one of the highlights of the holiday was lighting the Menorah. This unique candelabra has eight branches of equal height, plus one that stands out that is used to light the others. It is traditionally lit near a window or door. Of course, I loved getting involved and lighting one myself. Once I was old enough, my parents allowed it. Allowing children to light the menorah is a great teaching moment for fire safety, however, some children are simply too young. M is finally getting old enough to really understand and participate in things, and I want this Hanukkah to be special and exciting for him. 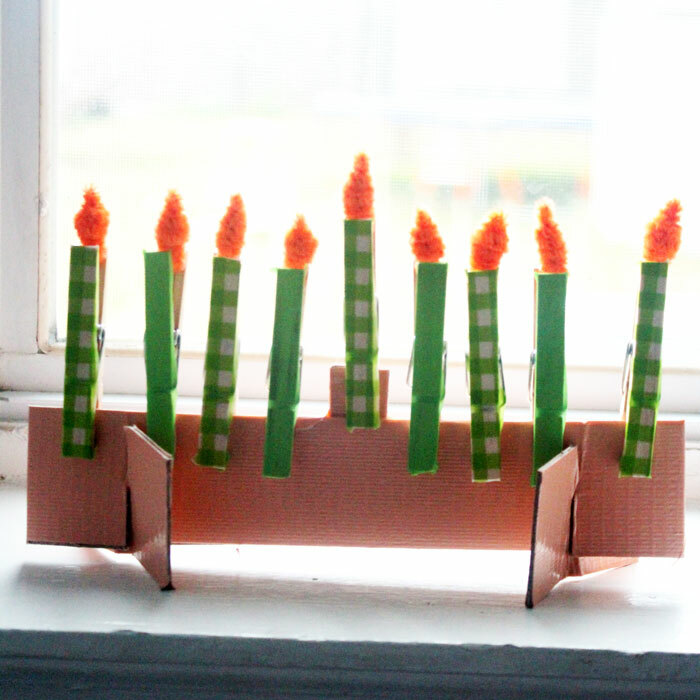 So, I made him this fun menorah craft so that he can actually light it. This makes for a great opportunity to teach a little bit of counting skills. M’s current counting abilities is sourced from Sesame Street and jumping on the trampoline and goes something like “three two three seven”. This Hanukkah, I hope to be able to teach him a new number every night using the menorah. 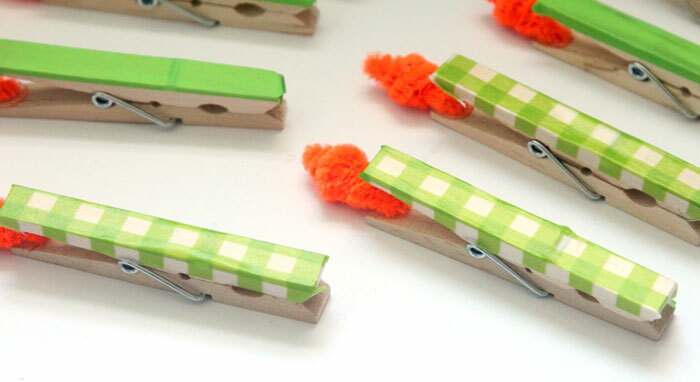 It’s a bit of a challenge for him – and a good one – to pinch the clothespin candle enough to slip it onto the cardboard. He did manage to do it, and it’s a great way to take his fine motor skills up a notch. 1. 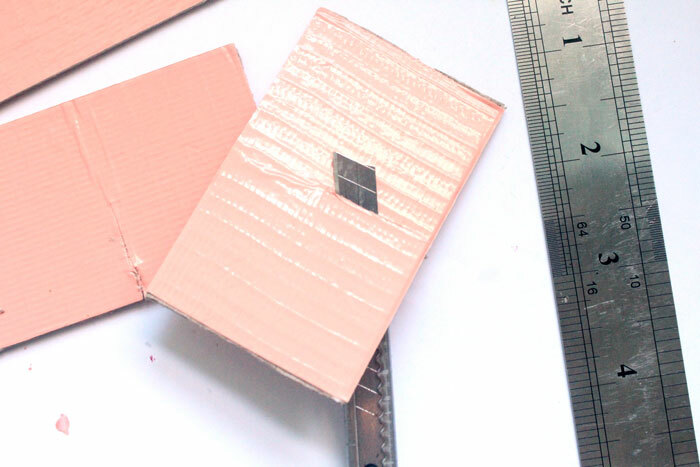 Place a strip of duct tape across your piece of cardboard. 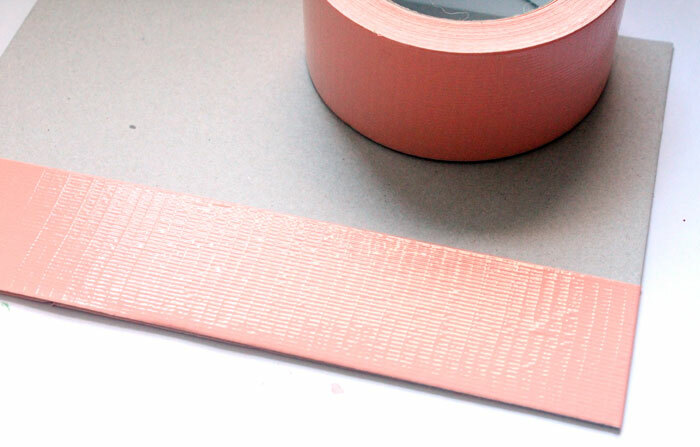 Cover both sides, about nine inches in length (longer can’t hurt) and the width of a single strip of tape. 2. 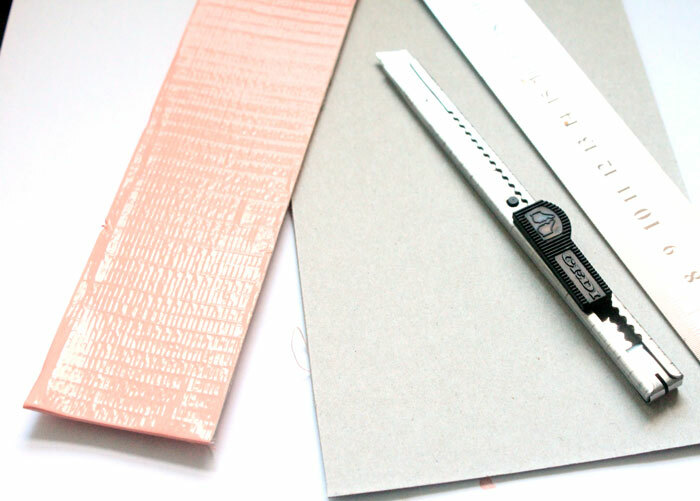 Use a ruler and craft knife to trim off that piece of cardboard from the rest. 4. 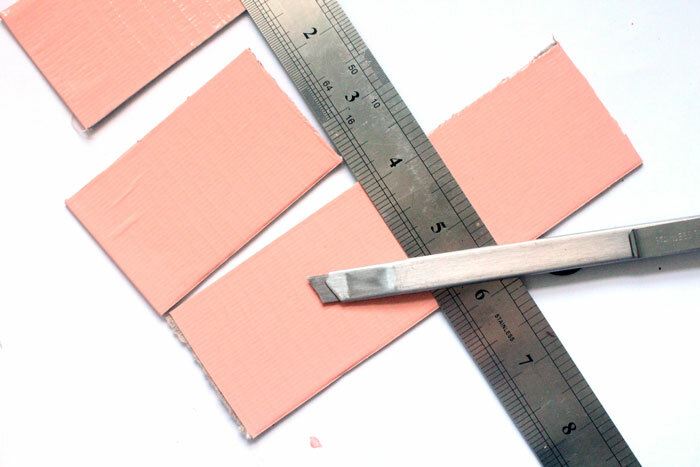 Cut a slit in the center of two of the three inch sections, slightly longer than halfway up the strip. 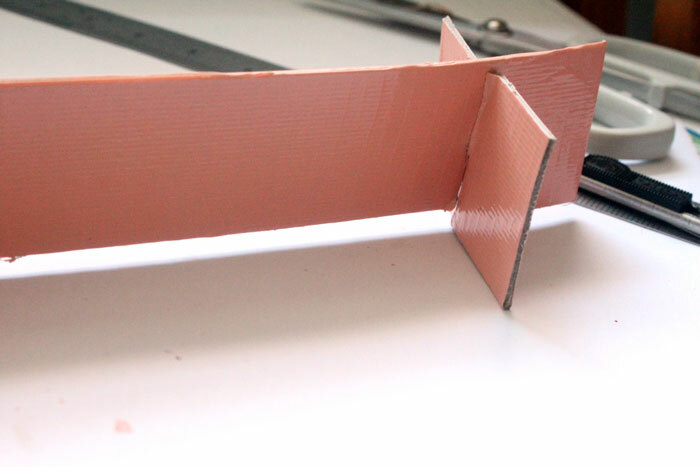 Cut corresponding slits on either side of the long strip created in steps 1-2, roughly 1.5 inches from the end. 4. 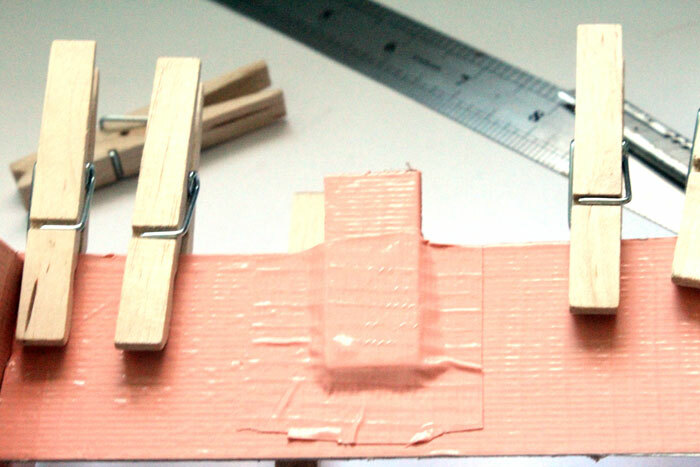 Place the long strip into the slits of the shorter strip. Make sure it stands well, and expand the slits if need be. 5. The “helper” candle (the 9th, that isn’t counted into the daily lighting) traditionally needs to stand out from the other candle. So, it can either be shorter (cut out a space for it) or longer (add an extender for it.) I added an extender using a piece of the last third from the duct tape strip that was turned into the stands or the menorah. The rest can be discarded. 6. 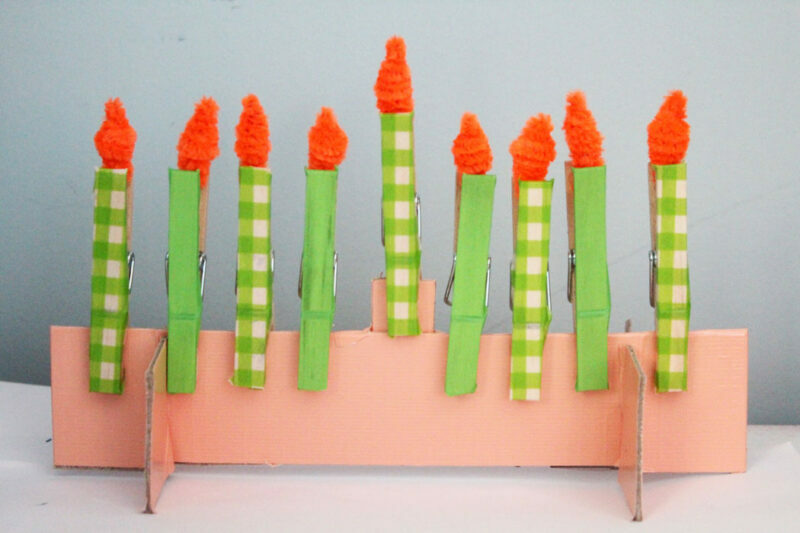 Time to make pretty Hanukkah candles! While traditionally they’re blue and white, they can really be any color. I liked how the green went with the peach, so I alternated the two colors. 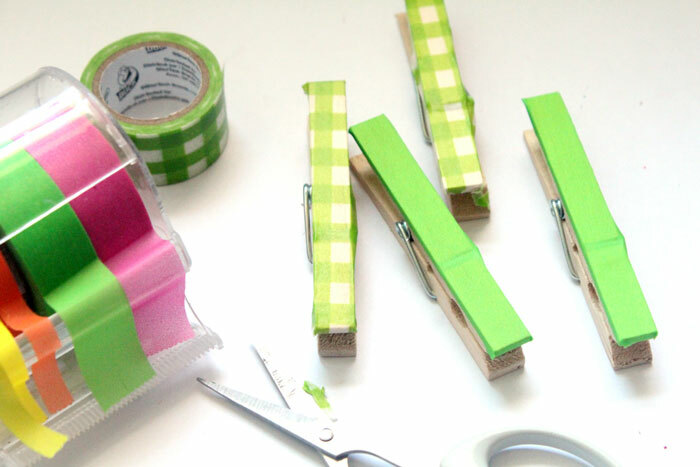 I wrapped washi tape around one side of the clothespin, snipping and trimming the edges. I may go and add tape to the second side too, so that it looks nice from both angles, but for now it’s only covered on one side. 7. 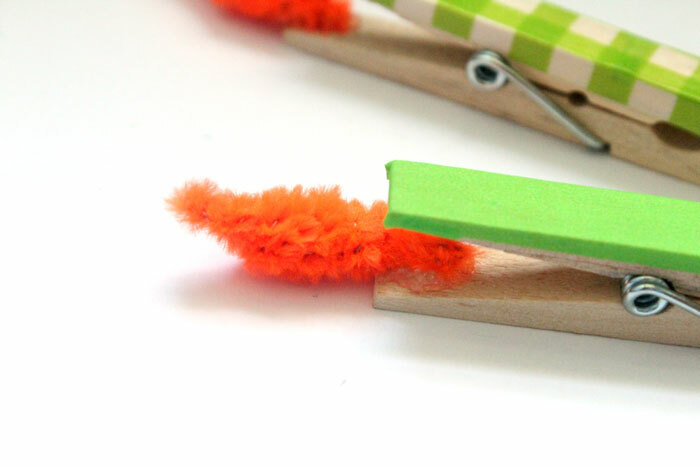 Time to make your “flame!” Start by bending over the end of a pipe cleaner. then fold it over again, in the same spot as the tip of the first fold. Wrap it around the doubled over section, and keep wrapping, focusing on adding more bulk to the middle. 8. 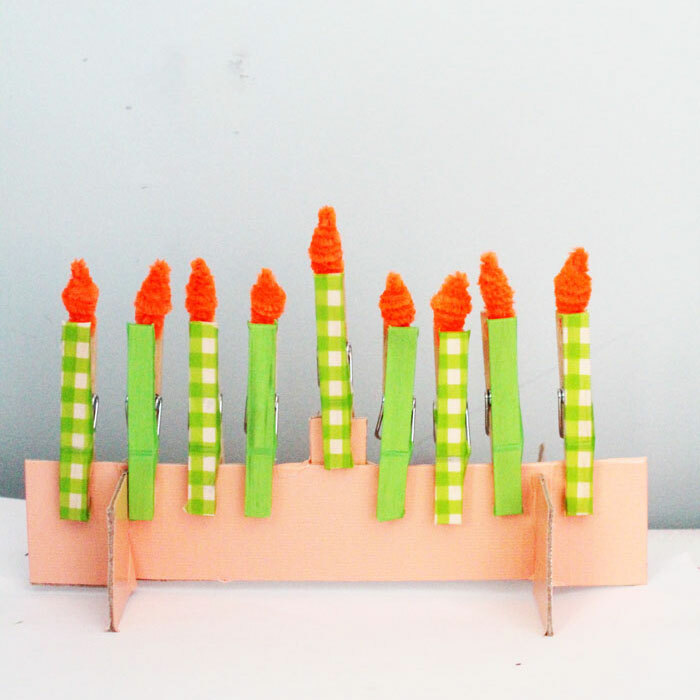 Glue the candles on to the inside of one side of the clothespin “candle”. I glued it onto the plain side. 9. Repeat with the rest of the candles. If you are using E6000 glue, wait overnight for it to dry before using it. 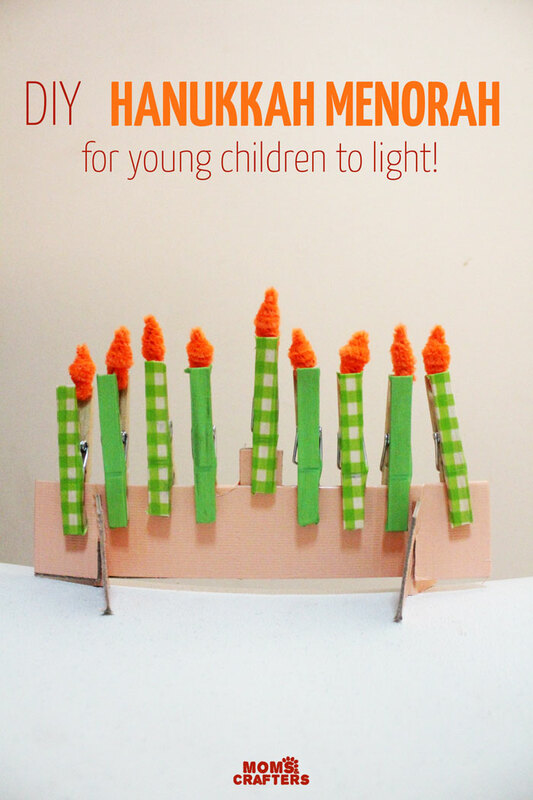 Your Hanukkah menorah craft for kids is ready to light and to use! 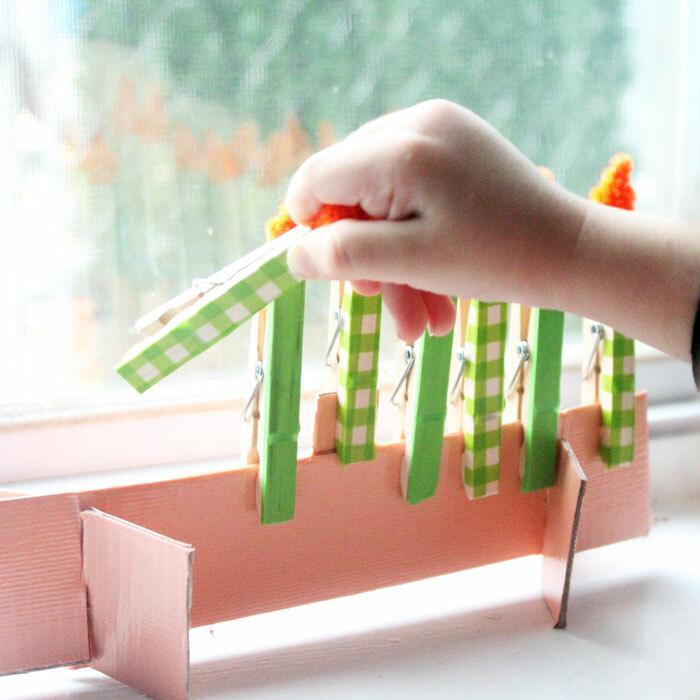 I hope you enjoyed this Hanukkah menorah craft for kids! If you did, feel free to spread the love using the sharing buttons to the left. You can also follow along with my Jewish holidays board on Pinterest for more great ideas for Hanukkah and year round! Follow Menucha @ Moms and Crafters’s board Hanukkah and other Jewish Holidays on Pinterest. 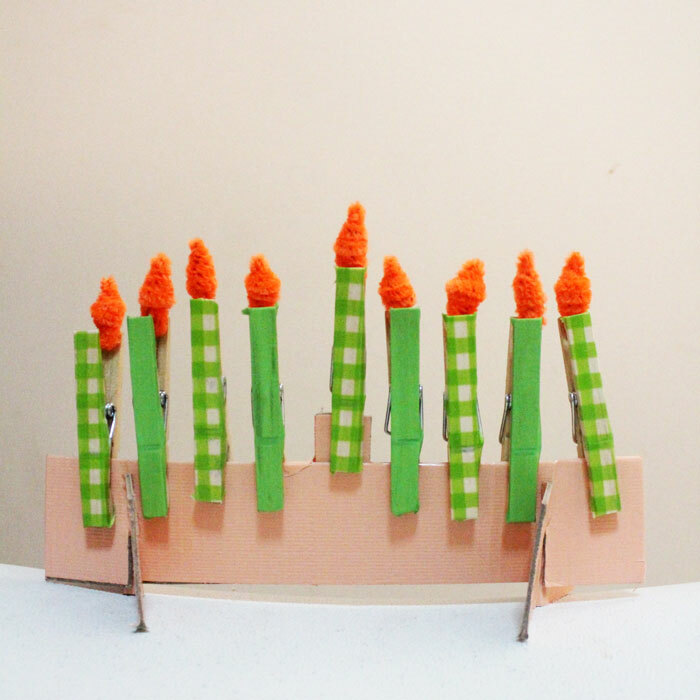 I am so delighted that many blog followers shared with me how they adapted this menorah craft! Jill covered the base with tin foil, and are those pop poms I see for the flames? Chaya made it on a small box (tissue or small shoe box) so that it can be used to store the candles as the holiday progresses. She also gave her daycare children pieces of colored paper to glue on to decorate, and allowed them to color the clothespins with crayons. And another blog follower made it with half a paper plate, and glued the rounded side to a piece of paper, so that it could be mounted on a wall. Crafts for moms, Holiday and Seasonal crafts, Jewish holidays, Recycled crafts, Toddlers, Winter crafts. Bookmark. Seriously adorable, love the plaid candles alternating with solid ones. Needless to say you will be featured at the top of the next party, thanks so much for giving me some badly needed chanukah content for the features! Namely for sharing on craft schooling Sunday, all the best! Thank you! My toddler loves it 🙂 Will try to stop by more often. That’s so clever! Every toddler would love that!